100 % cotton drawstring bag. 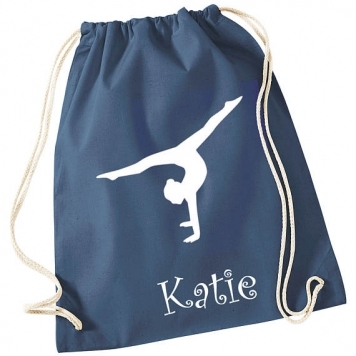 Personalised Gymnastics Bag for Girls. This lovely cotton drawstring kit bag features a gymnast silhouette and can be personalised with any name . Ideal for girls to carry their gym kit, and makes a great birthday gift! Large capacity makes it ideal for storing P.E. kit or sports kit, the drawstring cord makes it easy to open and close and can be carried on the back or over one shoulder. It is available in a variety of colours, simply choose from the drop down menu, then message the name you would like on your bag. Text is printed in white vinyl, giving it a durable and long lasting finish. Bags are made to order and dispatched within 3-5 working days.